I took this photo in the south of Portugal in 1974. A boat a-building along a riverside. Locally grown timber, locally sawn. Built by someone most likely the last of a long line of boatbuilders. 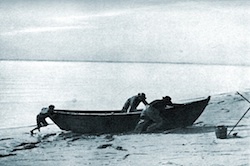 A working boat. No engine. Meant to be rowed, to be used on this same stretch of water until it was left to rot along the bank somewhere not too far away. 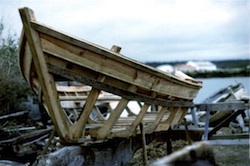 This was boatbuilding for thousands of years. These days it’s not so much. Call it an anachronism; but what’s held true for me all these years is how so much of what draws me to boats is right here. We live in different circumstances. Our approaches to boats and boating governed by different concerns. So much of what made this scene possible seems so distant to us. But…. Even a passing remark might spark further discussion. I wrote a book on the ins and outs of developing a new design. The hardest part is knowing where and how to begin. The menu provides various ways to explore.